Smack dab in the middle of the triangle formed by Milwaukee, North, and Western Avenue, situated on a quiet, tree-lined block at 2300 West Wabansia, is an old manufacturing building that was converted to loft condominiums in 1996. Today the building is called Clock Tower Lofts. 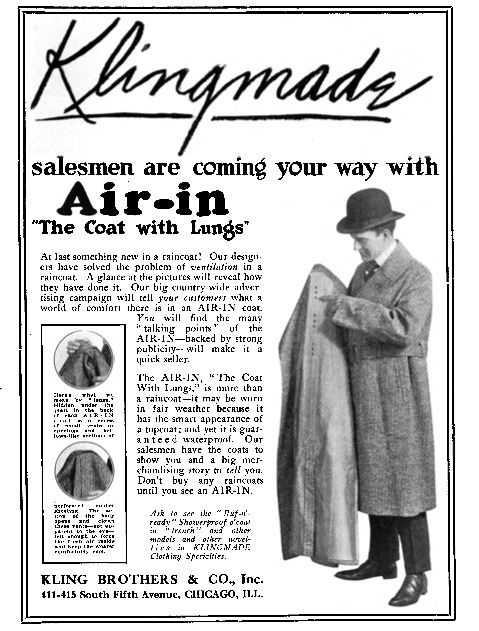 But back in 1919 when the plant was finished it was the home for a wholesale clothing business, Kling Brothers. The initials of the firm are still there, right above the entrance to the building. The guiding hand behind the venture belonged to Leopold Kling. Born in the village of Dauendorf in Alsace-Lorraine, he managed to graduate from business college at the age of 14. In 1895 he came to the Chicago, where he became a United States citizen in 1900. Two years after he arrived, at the age of 19, he opened a small tailor shop on Halsted Street. Within the space of ten years Leopold, along with his brother, Samuel, had built up the business enough to commission one of the most prominent architects of that period, Alfred Alschuler, to design a loft building on the west side of the city at 2300 Wabansia. This could not have been an easy to time to get into the garment business. Labor unrest in the industry reached its peak even as the company was contemplating the new factory on Wabansia. In September of 1915 the Amalgamated Clothing Workers of America, a faction that had seceded from the United Garment Workers of America, ordered a general strike in Chicago that took 25,000 garment workers out of 400 shops in the city. The strife continued for months. On October 26 of that year, Samuel Kapper, a 35-year-old deaf and dumb tailor on picket duty was shot to death near Halsted and Harrison Streets. By the third week of November the union issued a list of 687 strikers who had been hospitalized as a result of beatings or stabbings. Unrest continued all the way into the next decade as businesses and unions sparred with one another. But the Kling Brothers prevailed, eventually acquiring the Edward V. Price Company, another garment manufacturer, and moving their executive offices to West Van Buren Street. 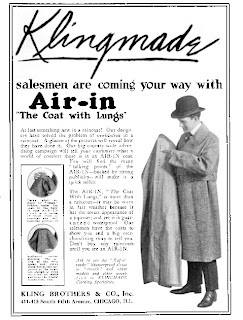 Leopold Kling also served as president of the Maier-Lavaty Uniform Company, which is still in business with its headquarters in Baltimore, Maryland. Leopold Kling also was heavily involved in the growth of Mt. Sinai Hospital, the second Jewish hospital to be established in the city. Kling served as Vice-President of the hospital from 1934 to 1946, as President from 1946 to 1949, and as Board Chairman from 1949 to 1952. During his tenure the hospital’s size grew from about 60 to 425 beds. He donated the money necessary to build a fountain and a 600-seat auditorium, and in 1957 he contributed $150,000 toward a million dollar fund to build a new interns’ residence. Leopold Kling died in 1962 at the age of 84. His brother, Samuel, who lived to be 91, died five years later. Alfred Alschuler, the designer of the 1919 factory on Wabansia, was one of the most prolific architects of his time, designing everything from synagogues to factory buildings. His London Guarantee and Accident Building, now 360 North Michigan, is one of the most recognized buildings on the Chicago River. Alschuler was among the first generation of architects to move through the architecture program that resulted from the 1893 agreement between the School of the Art Institute and the Armour Institute of Technology. Studying with him were men such as George Eich (later to become a significant contributor in the office of Howard Van Doren Shaw), George Willis (who would move on to be the chief draftsman in Frank Lloyd Wright’s Oak Park studio), and Charles Tobin (Wright’s brother-in-law and Walter Burley Griffin’s replacement in Wright’s Oak Park studio in 1906). Alschuler, himself, began his practice in the office of Dankmar Adler in 1899. Within a year Adler died, and the young architect went to work for Samuel Treat. By 1904 he had become a partner in the firm. He worked at Treat & Alschuler for three years before establishing his own practice in 1907. To appreciate how many structures he designed in the city during his career, check out the map here. The factory on Wabansia was just one of scores of buildings that Alschuler designed during his career. In 1996 a remarkably sympathetic renovation orchestrated by Hartshorne Plunkard divided the former garment factory into 113 condominium units. The building's Arts and Crafts ornamentation, straightforward presentation, and horizontal emphasis is in keeping with the Prairie Style designs of such notable architects as Dwight Perkins, Charles C. Nimmons, and Walter Burley Griffin. Situated in a quiet neighborhood in Wicker Park, Wabansia is a lovely tree-lined street that is just a block or two away from some of the great old homes that Chicago’s German and Polish settlers built with the wealth they had gained from their hard work in the rapidly growing city. If you want a great walk on a sunny day, start at the Clock Tower Lofts and walk east to Leavitt. Turn south on Damen and check out the homes on Pierce, LeMoyne and Evergreen. It is one of the most eclectic neighborhoods in the city; every home with its own distinctive style. And the old Kling Brothers factory, now Clock Tower Lofts, fits right in. Great article! I live at ClockTower and it's great to get some history on the building. I accidentally took a wrong turn on my way home and came across this building! I love that I live in such an amazing neighborhood with so much history! Thank you for posting this! I purchased a garment (small child/boy? jacket) with the label stating Kling Chicago HBD. Also there is some type of insignia between the "Kling" and "Chicago". I can't see the entire insignia because is is worn out The jacket has frontal buttons and the quality is excellent with a heavy material. I'm trying to find out any info regarding this jacket-mostly the approximate date it was manufacture. Interesting tidbit about is that the item was purchased in Wisconsin!